Today is a prelude to tomorrow, so there isn’t a whole lot to write about. There were three routes to choose from when leaving Villafranca. 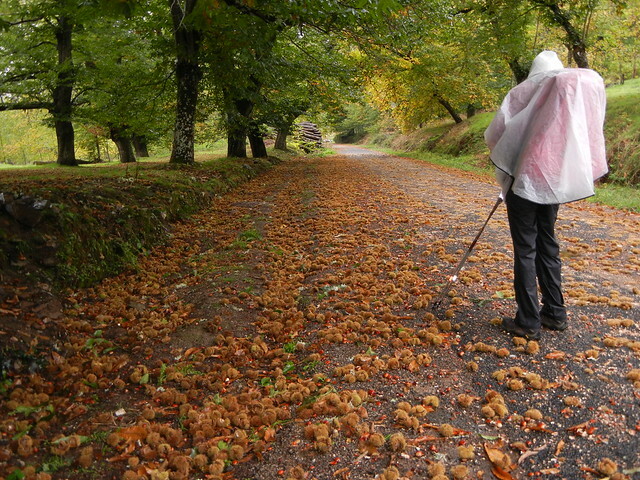 The Camino Dragonte is the longest, most arduous, and also the most spectacular. The Ruta Pradela is the recommended route because of the wonderful views back over Villafranca. 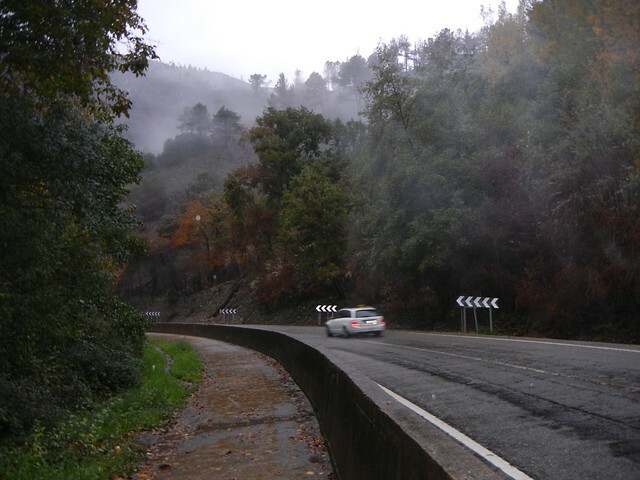 The Ruta Carretera is the easiest one, snaking its way alongside the main road and following the river valley. Because Dave’s back had been bothering him, he planned to take the easiest route, Ruta Carretera. I would take the more scenic Ruta Pradela. Dave and I would meet at Trabadelo, 11.7 km. from Villafranca. Our plans changed when we woke up to steady rain and mist. It would have been a wasted effort to take the Ruta Pradela, because there would be no wonderful views to enjoy. 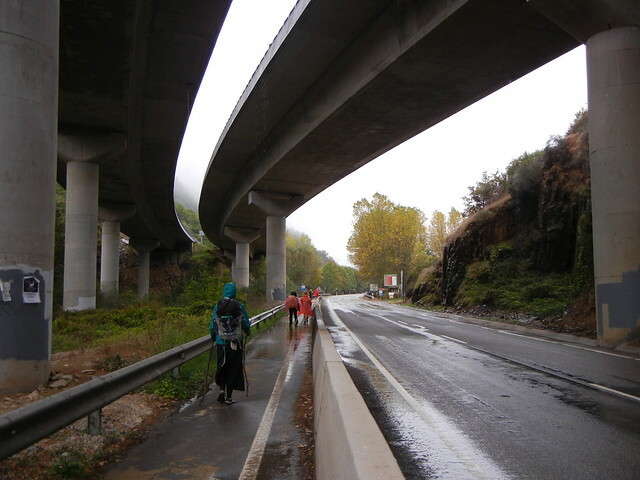 We both walked the Ruta Carretera that follows the main road, with the new, busier highway crossing overhead several times. The valley is steep sided and heavily wooded with mostly pine and chestnut. We walked through the little villages of Pereje and Trabadelo and, by the time we reached La Portela de Valcarce and saw the big “Hotel Valcarce” sign, we were tired and didn’t feel like going any further. The overall feeling of the hotel with the big gas station and lots of parking is that it caters to truck drivers. It doesn’t seem in keeping with the Camino de Santiago to stay here, but here we are! Our room faces the main road, so it will be a good night to pop in those earplugs. Tomorrow we’ll be facing one of the steepest and most scenic climbs of the whole journey and will need a good night’s sleep tonight. We are expecting sunshine. Hooray! We are all inspired by your journey and by the election results here at home. You will most likely have heard that we have a Liberal majority. Also the Jays won last night. I’m beginning to wonder how much further you have to walk? Exciting news from Canada! We only have 155 km yet to go. Today was soooooooo wonderful, I can’t wait to write about it! Stay tuned.